American Doll and Book (Ends 4/1/14) | A Savings WOW! To enter, complete the mandatory entry in the Giveaway Tools form below. Complete the other optional entries for more chances to win! Organized by: Mom Powered Media. Giveaway ends April 1st at 11:59pm, open to US and Canadian residents, ages 18+. Disclosure: The participating bloggers were not compensated for this publication and are not associated with any of the companies named above. No purchase is necessary to enter. One entrant per household, per address. Void where prohibited by law. The odds of winning are based on the number of entries received. Winner(s) will be contacted by email and have 48 hours to respond. My blog is not responsible for product shipment/delivery. This event is in no way administered, sponsored, or endorsed by, or associated with, Facebook and/or Twitter, Google, Pinterest. Contact teri@mompoweredmedia.com if you have any additional questions or comments. Please see our disclosure policy for more information. 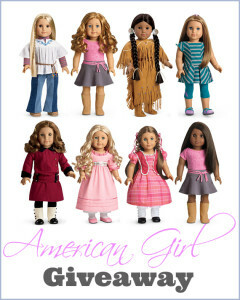 My daughter wants the My American doll short blonde curly hair, blue eyes doll.